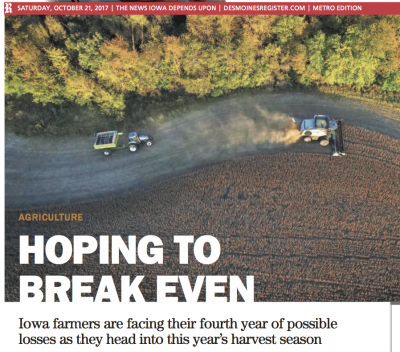 An article on the front page of Saturday’s Des Moines Register explored issues associated with corn and soybean production, prices, and farm profitability in Iowa. Meanwhile, the Federal Reserve Bank of Kansas City released a paper last week which noted that, “Lending at agricultural banks appeared to stabilize in the third quarter of 2017, but risks in the sector have remained alongside a persistently weak agricultural economy.” Today’s update includes highlights from these two current news items that shed additional light on the state of the Corn Belt farm economy. Donnelle Eller reported on the front page of Saturday’s Des Moines Register that, “Here are some numbers worrying Nodaway farmer Bill Shipley: He could get $8.96 for each bushel of soybeans he brings to his southeast Iowa elevator. 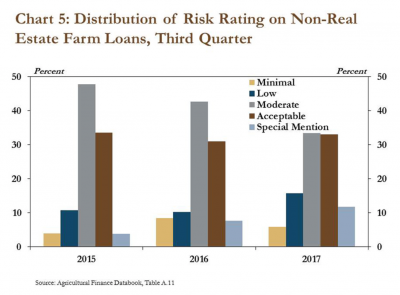 “But the statewide average cost is over $9 a bushel. “Hoping to Break Even,” by Donnelle Eller. 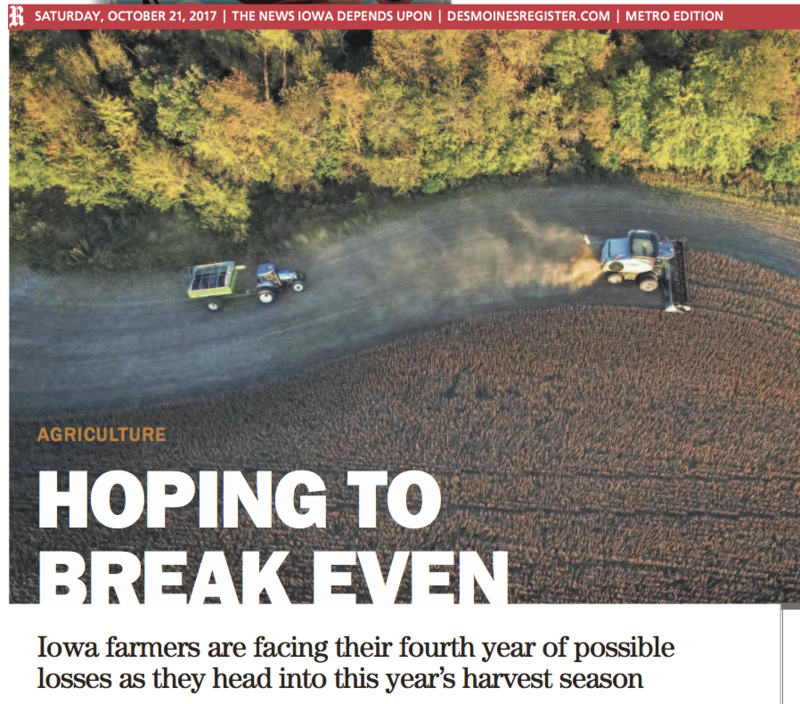 The Des Moines Register (October 21, 2017). Iowa Ag News – Crop Production. 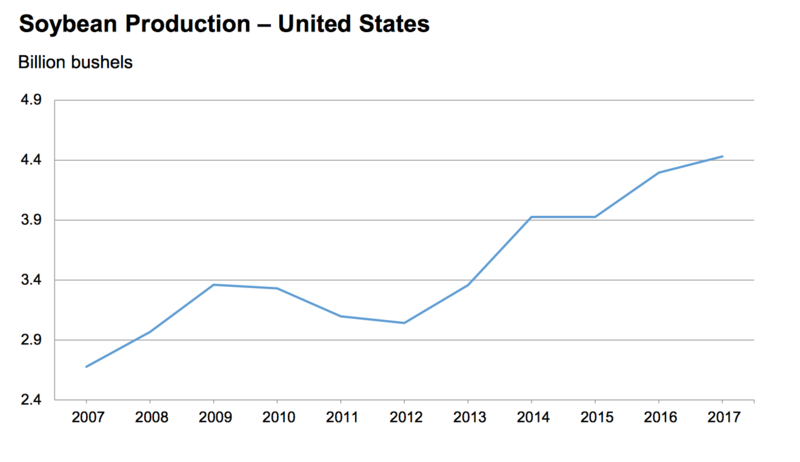 USDA- National Agricultural Statistics Service. Upper Midwest Regional Field Office (October 12, 2017). 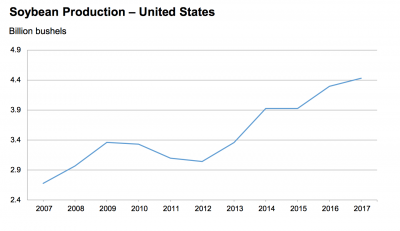 Crop Production Report. 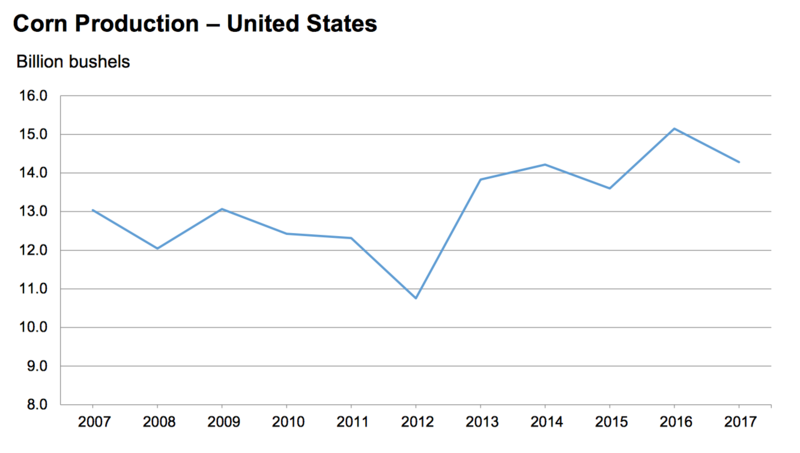 USDA- National Agricultural Statistics Service (October 12, 2017). “U.S. 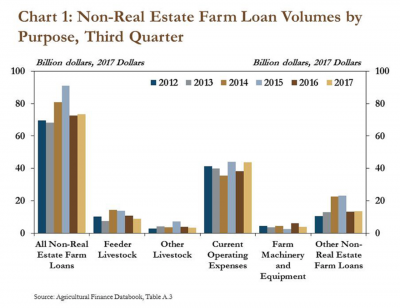 farmers are expected to see a 3.1 percent increase in profits this year, thanks largely to improved pig, cattle and other livestock returns. 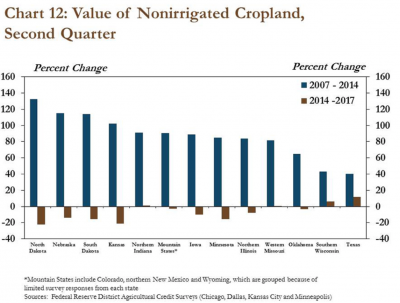 “But Hart says Iowa farms will be lucky to see a 1 to 1.5 percent increase, given the state’s large grain production. 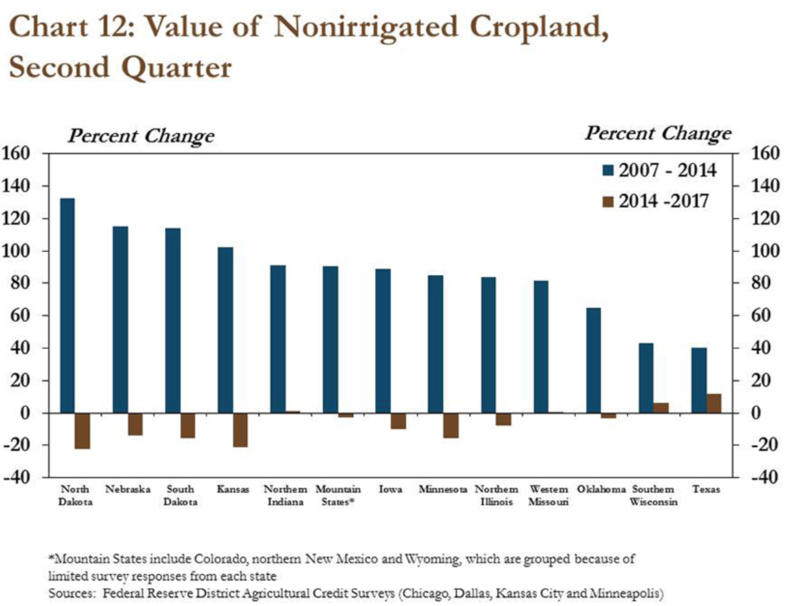 ‘For a good number of Iowa farmers, it will be a fourth year of losses,’ Hart said. 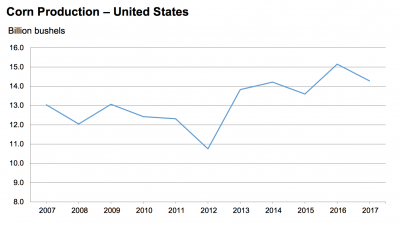 Ms. Eller added that, “Since 2013, Iowa farm income has dropped $5.72 billion to $2.6 billion in 2016, U.S. Department of Agriculture data shows.” (See also, “Iowa State University- ‘Financial stress in Iowa farms 2014-2016‘”). Saturday’s article also stated that, “It’s not just corn and soybean prices that are on Shipley’s mind. “He and Ray Graesser, both southwest Iowa farmers, are concerned about the Trump administration’s efforts to renegotiate the U.S. trade agreement with Canada and Mexico. “Farm Lending Stabilizes, but Bank Liquidity Tightening,” by Nathan Kauffman and Matt Clark. Main Street Views- Federal Reserve Bank of Kansas City (October 19, 2017). Last week’s update noted that, “In addition, the pace of increased demand for loan renewals and extensions has steadied somewhat over the past several quarters. 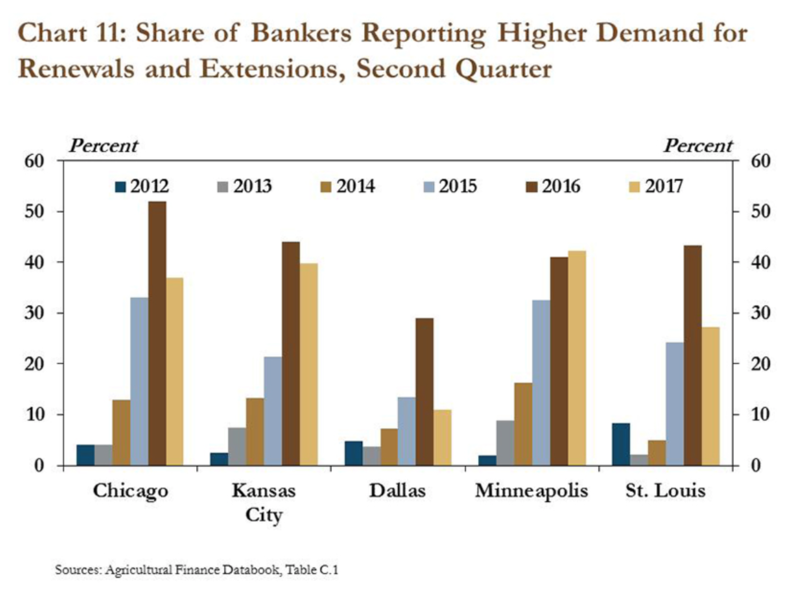 For instance, the share of bankers reporting increased demand for renewals and extensions declined in the second quarter in most Districts with a significant agricultural concentration (Chart 11). Only the Minneapolis District reported a very minor increase.